More than 200,000 people still get leprosy every year. 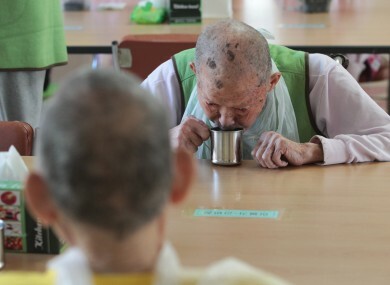 A man with leprosy drinks water at a specialist hospital in South Korea. FARMER FOLAHAN IS one of up to 200 people in the west African country of Benin who still contract leprosy every year. Her face is covered in nodules – a symptom of the condition – when she arrives at the screening centre in the town of Pobe, in the east of the country. Doctors put her on medication straight away. If she takes it properly for 12 months and there are no side effects, she will be completely cured. Leprosy is officially a disease of the past, relegated to the annals of history with conditions such as smallpox and bubonic plague. But more than 210,000 people across the globe still contract it annually. The disease, which affects the skin and nerves, causing grave damage to the hands, feet and eyes, is spread by close contact between people, particularly those living in poverty. Folahan’s four-year-old son will need to be monitored closely. In 2000, the World Health Organisation said that leprosy, a disease long associated with biblical times, was no longer a public health problem with a rate of less than one case per 10,000 people. “It’s true that leprosy affects fewer people than malaria,” said Beninese doctor Roch Christian Johnson, who is the current president of the International Leprosy Association (ILA), on a return visit to his home country. But here 25% of the cases detected already have serious and debilitating handicaps. In the tiny nation of Benin, between 150 and 200 new cases of leprosy are recorded every year, of which 10% are children. That number hasn’t changed much in a decade. The screening centre in the heart of Pobe was built by the Fondation Raoul Follereau on the site of a former leper colony and has taken in about 20 patients every year since 2000. Pobe is situated near the border with Nigeria, Africa’s most populous nation, which every year records some 4,000 cases of leprosy. “Patients always arrive too late, when their wounds are gangrenous,” said Thierry Gateau, who runs the Pobe centre. People with leprosy are often farmers like Pascal Boton, who don’t get a diagnosis early enough and damage their numb limbs. Boton had an accident and didn’t feel anything but, as it does with most cases, the wound got infected and his foot had to be amputated. “Nurses came to give me medication and then they stopped,” he said. Without regular treatment, the symptoms of leprosy don’t go away. “It’s a sensitive issue,” said Annick Chauty, a French doctor, who has spent 15 years in Pobe. In Benin, “it’s thought to be an illness caused by bad luck”, added Ambroise Adeye, a surgeon for the foundation and the town’s public hospital. People with leprosy first go to see traditional healers and that makes things worse. They then have to save up to pay for a consultation. But treatment for leprosy, which involves a course of three antibiotics, is free and prescribed in free clinics across Benin. To spread the word, the National Programme Against Leprosy, run by the country’s health ministry, broadcasts messages on community radio stations and conducts awareness programmes. People with leprosy, many of them left disabled by the disease, have seen their houses knocked down and fields trampled. Wives have been thrown out of their homes. Oladele, a 24-year-old barber, for example has been leprosy free for three years. The only traces of the disease are his slightly clawed fingers. “I don’t want to go back to the fields. The centre offered me training. I chose hairdressing,” he said. Sessions with a physiotherapist mean he can hold the cutters and scissors without any problems. His boss is supportive and his family paid for his apprenticeship. When money isn’t available, the Follereau foundation steps in and pays for rehabilitation. “There’s better acceptance but people who’ve had leprosy need help,” said Gateau. Email “The people still fighting leprosy, years after the world stopped paying attention to it”. Feedback on “The people still fighting leprosy, years after the world stopped paying attention to it”.